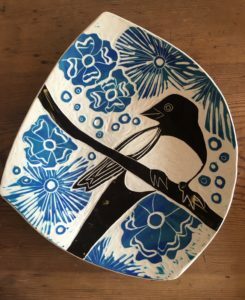 Drawing on the Dream we will feature new original monoprints by Denise Kester and the vibrantly illustrated ceramics of Julia Janeway. Drawing on the Dream is the title of Denise Kester’s new book about her creative process and the characters that populate her dreams and her images. Denise’s book will be available for purchase and signing during the artist reception on First Friday, October 6th 5-8 p.m.
Show runs October 6th-November 1st. Denise Kester is a printmaker specializing in viscosity printmaking in monoprints and monotype prints. 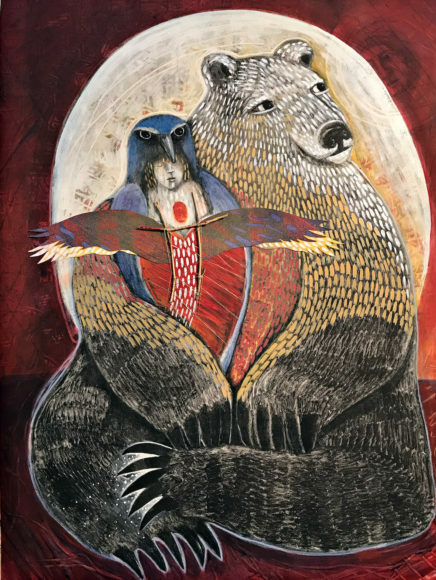 She is an artist whose inner dream life is populated by a variety of characters: brown bears, black crows, blue monkeys, sea turtles, rabbits and more. Denise brings these characters to life in her work. It is a two way street, she says, while she draws from the dreams, the dreams draw from her; she reaches for the stories and the stories reach for her. They are stories and characters that, while deeply personal, prove to be universal at the same time. 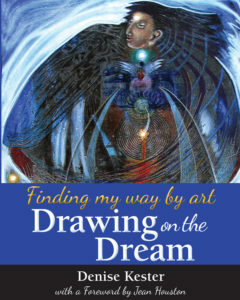 In her new book, Drawing on the Dream these characters guide Denise through a year of difficult artistic creation. Part instruction for artists but even more a profound illumination of the way of the artist, the book contains Denise’s brilliant monoprints in all stages of creation to completion along with the poetry and stories that inspired her work. Julia Janeway’s boldly colored, illustrative ceramic work is about the love of storytelling. Growing up around art but pursuing a Ph.D. in English, Julia shifted careers after inheriting her mother’s well-used wheel, kiln and a series of mysterious glaze recipes. The illustration aspect of her work borrows heavily from books, particularly woodcut and lithograph prints. She often incorporates words into her designs along with layers of colored slips and underglazes. Each piece is hand carved from original patterns and drawings.